The time has come. 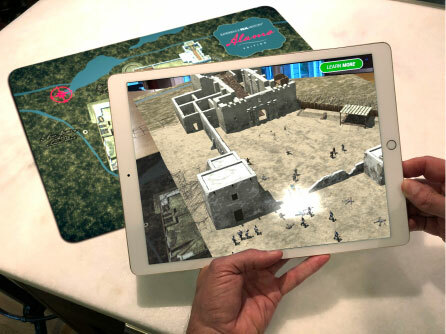 You have the power to visit the year 1836 and the lost world of the Texas Revolution where augmented reality makes time travel happen. Using a reality board and your smartphone or tablet, your class now has a window on an international legend. 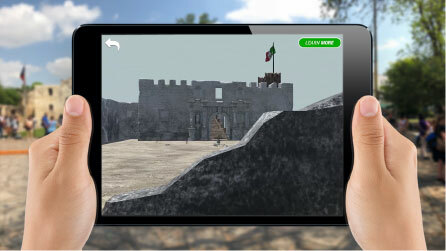 A reality that doesn’t tell you a story, but shows it with accurate, photo realistic reconstructions of the church and small garrison where the legend was born. Your class will see and hear the sounds of battle along with a narrator who explains the saga taking place before their eyes. A living textbook for history … authored by your students' curiosity. The time has come to explore a subject that would’ve taken hours to understand with a textbook. A subject that is now unpacked in seconds, as your eyes and ears make you a living observer to real history. Start the adventure! Texas History Educators... now every student can travel to San Antonio circa 1836 to immerse oneself in the events of the ultimate story of freedom and sacrifice: The Battle of the Alamo. Our augmented reality app and materials provide standards-aligned content, lessons, and support materials. We provide training to teachers who want their students to not only master the standards, but appreciate, remember, and connect our state’s history to today’s Texas identity, and perhaps even shape its future. Lessons that accompany the app’s bias-free content and materials were developed from well-researched national models for sound instruction and assessment. They are aligned to 4th and 7th grade Social Studies, English Language Arts, and Technology Application TEKS. Although Augmented, Virtual, And Mixed Reality technologies are not new, they are increasingly finding their way into classrooms. Through them, students can travel anywhere in the world, experience the past, and explore ideas and concepts more concretely. There is a delicate balance between content, delivery, and classroom management. We can help you tip the scales in favor of engagement and learning and minimize disruptions. Is it a professional goal to improve student outcomes using educational technology? Our products, materials, and support can help teachers set and communicate goals and related professional development. Teacher and student feedback matters to Experience Real History. We welcome suggestions for ongoing improvements to current and future projects. Experience Real History is currently scheduling professional development sessions. We work with districts to offer training that best meets their needs. One-on-one or small group trainings using online platforms are also available by request. In the future, Experience Real History intends to offer a variety of online training and tutorials along with face-to-face conferences that focus on bringing both cutting edge and proven instructional practices and resources together for teachers. Being the first to try something should have advantages and Experience Real History wants to show our appreciation by providing a high degree of accessibility to our staff, soliciting and listening to user feedback, and making sure that early adopters are the first to know about new features and opportunities. We offer products in packages that suit your classroom or district needs. A 30% discount is offered for purchases of FOUR or more Academic Team Sets or $496.78 per set. Please fill out the form below and someone will contact you within 24 hours to provide quantity pricing information.